Thank you to everyone who participated in the ARF/RHD Guideline survey. The aim of this exercise was to gather feedback from the health workforce regarding information they would like in the new guidelines, and how they would best like to access it. Overall, gaining support for clinical practice is the most common reason respondents consult disease management guidelines. Nurses and allied health staff are the groups most likely to consult guidelines for clinical support, while doctors and specialists are most likely to consult guidelines for professional education and/or academic reference. Of the doctors who do consult guidelines for clinical support, half are based in a rural or remote area. The internet (PDF) version of the full Australian ARF/RHD Guideline is the resource most commonly referred to by all groups except nurses, who refer to the printed book slightly more frequently than the internet document. The PDF quick reference guides have also been used by nearly 30% of all respondents. The smartphone app has been used by 32% of the doctors, 30% of the specialists and 22% of the nurses who completed the survey – half of these people are based in a rural or remote area. Thirty two percent of survey respondents have not consulted the ARF/RHD Guideline in any form. Sixty-seven percent of the survey respondents reported that they have consulted other disease guidelines or protocols for information on ARF and RHD. The CARPA Manuals are the most commonly consulted; only half of the respondents who reporting using CARPA are based in a rural or remote area. UpToDate is commonly used among doctors and specialists, and the Australian Therapeutic Guidelines are used by all groups. 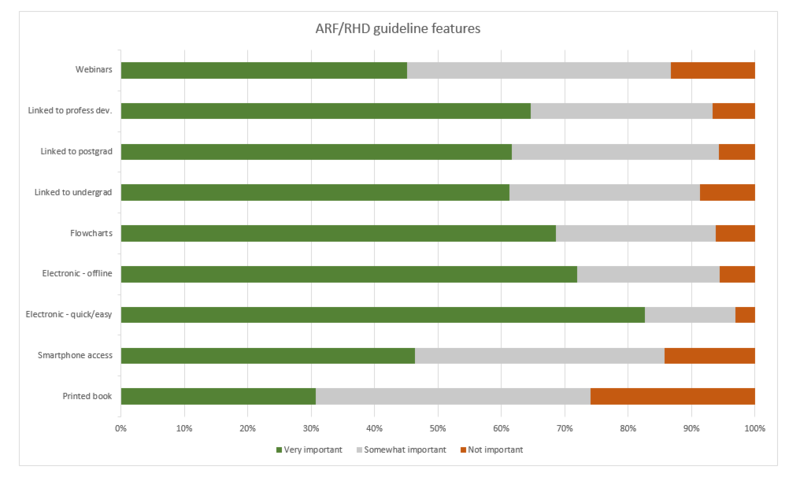 Of the people who have not consulted other disease publications for information on ARF and RHD, almost half have referred to the Australian ARF/RHD guideline information in some form. This leaves 17% of the survey respondents reporting that they have not consulted any publication for information about ARF or RHD. Survey respondents consider a printed book to be the least important, and electronic platforms that are easy to use and available offline to be the most important features of disease management guidelines. While the next edition will be available as a printed document, we also plan to invest in technology to ensure that the information is easy to access for all. The additional comments received from survey respondents will be used to inform the writing and delivery of the next edition. There is overwhelming support for a national guideline that is comprehensive enough to support the academic community, but structured and delivered in a form to support busy clinical practice.